Race violence was all too common throughout American history. As I studied the history of my own parish, St. Bernard, I started to unravel a brutal massacre absent from almost any historical narrative. Congressional inquiries into the massacre paint an atrocity. At the time it was dubbed the St. Bernard Riot, but it really has no official name. What’s in a name, anyway? The term riot was provided by whites, whether in the newspapers or remaining government records. That term does not give it justice, and implies mass chaos must’ve ensued. It has been recognized and used by the very few who mention it, but I choose to label it by a much more appropriate term: The St. Bernard Massacre of 1868. It was not chaotic, but a deliberate, systematic slaughter of humans who were just liberated from their chains circa six years prior à la the Emancipation Proclamation. In order to understand the violence, we must understand the circumstances associated with it. Reconstruction Louisiana was a tumultuous era. During the Civil War, many Louisianans fought with the Union. New Orleans, the most populous city in the Confederacy, surrendered without a shot fired as it was more cosmopolitan, industrial, and more sympathetic to the Union than the rest of the Confederacy. This is unsurprising as the population contained thousands of gens du couleur libre– free people of color- and it was more commercially similar to Northeastern ports than Confederate cities. This pro-Union mentality contrasted starkly with the slave-owning elite and their avidly racist counterparts. The Civil War revoked some privilege of many wealthy whites and disenfranchised many poorer whites, who were newly engaged in labor competition with eager freedpeople. On the contrary, African-Americans received more rights than any other previous time in U.S. history. The federal government established the Freedmen’s Bureau to help enslaved people transition (whether they did enough is debatable) and new amendments gave African-Americans more rights, albeit persecution never ceased. Disenfranchised whites quickly scapegoated African-Americans for any inconvenience, even though the living conditions of whites still surpassed those of African-Americans. This volatile environment created strife. In 1865, Henry Warmoth was elected as the first Republican governor of Louisiana. His Lieutenant Governor, P.B.S. Pinchback, became the first African-American governor in the U.S. Due to the influx of freedpeople voting Republican, the Democrats, who enjoyed reign over the state, were suddenly outnumbered in Louisiana. They were upset, and the backlash was deadly. A race riot occurred in New Orleans in 1866, which led to the death of over 30 African-Americans. In Opelousas in September 1868, a massacre resulted in the deaths of around 200 African-Americans (depends on the estimate). A month later, black citizens of St. Bernard Parish fell victim to a similar slaughter. St. Bernard Parish was a plantation community with few Isleños towns further “Down-the-Road” (a reference used even in the 19th century). The Isleños are a community of Spanish decedents from the Canary Islands who migrated in the 1700s during the Spanish colonial era of Louisiana. The majority of the population was comprised of enslaved African-Americans, and thus during Reconstruction the parish quickly transitioned from Democratic to Republican. Warmoth received 65.5% of the vote in the parish. The parish also voted in favor of Louisiana’s Constitution of 1868 by 55%, which was bar none the most progressive in the South and arguably the nation. It abolished the Black Codes, granted African-Americans equal access to public accommodations, and even attempted to integrate public schools. While theoretically progressive, it did little to end racial discrimination. In April 1868, Dr. A. G. Thornton, a white physician and known Republican, was elected parish judge. St. Bernard Parish was well underway in becoming a Republican stronghold and perturbing the established political and economic status quo. The Democratic minority of St. Bernard Parish was fuming as the national presidential election of 1868 emerged. The ticket options consisted of Republican and Union veteran Ulysses S. Grant against Democrat and former governor of New York Horatio Seymour. Whites had much to gain if Seymour would have prevailed; it would have meant an end to Reconstruction and autonomy for states and counties/parishes. It was obvious St. Bernard Parish, along with Louisiana, would vote Republican unless the Democrats could intimidate the opposition. Trouble started brewing. Accounts vary, but all of the information obtained is gathered from primary source testimonies assembled in a Congressional Serial Set and attempts at dissecting overtly biased news articles from the New Orleans Times. Before the massacre, it was illegal for an African-American to carry any sort of weapon, and anything which can be construed as such is liable for arrest. Thomas Ong, a local plantation owner and Republican, claimed African-Americans were warned by the police “not to carry arms; that any found with arms would be immediately arrested…” Apparently this was for their safety, but the move left thousands of African-Americans defenseless. On Sunday, October 25th, multiple Democratic organizations: Constitution Club, the Bumble Bee Club, and the Infantes de Seymour (from New Orleans) assembled near the then parish courthouse for a march to the old St. Bernard Church. It was a motley crew of Isleños, newly migrated Sicilians, poor French, and anyone else who supported the Democrat cause. During the procession, whites approached two freedmen and attempted to coerce them to cheer for Seymour. When they refused, whites drew weapons. According to a few reports, one of the freedmen, Eugene Lock, defiantly drew a pistol. Lock was shot to death and the other seriously wounded. Whites started to rally as their first victim fell. Freedpeople soon realized a massacre was on the way and began to gather. Some freedmen made their way to Ong’s plantation to protect him because his fairness to freedpeople and his Republican views made him a prime target. On the way, they passed the house of Pablo San Feliu, where he brewed whiskey and baked. Feliu was a Spanish immigrant who married a local Isleña. Some accounts claimed the freedmen attacked Feliu, others claim Feliu attacked at random. One local white man, Philip Taylor, testified to Congress that Curtis warned metropolitan police and freedpeople not to pass Feliu’s establishment or they’d be shot. According to all accounts, Feliu, for whatever reason, fired his shotgun first and instantly killed a freedman, and wounded several others. Blacks retaliated and stormed the house, killing Feliu and burning his house down. Whites had their scapegoat. Local sheriff, Chailaire, and a parish judge, Philip Toca, began arresting freedmen at random and charging them with the murder of Feliu. The local government conspired against African-Americans and not one order given by Dr. Thornton, the legitimate Republican parish judge, was followed. During the entire days of Monday and Tuesday- the 26th and 27th, Oct., parties of armed white men… roamed over many plantations of the Parish, shooting and knocking down, and otherwise maltreating freedpeople, driving them pell-mell from their cabins, seizing guns, pistols, knives, -destroying Registration Papers… in short taking everything they could appropriate to their own use. They plundered the Millauden, Dar Quanto, and other plantations and their cabins, wounding or killing freedpeople. One freedmen, Eugene Joseph, was shot in the lung at Bencheque, and was struggling to survive. Instead of killing him, they arrested him. Dozens of unfortunate freedpersons died in the mayhem. If they gave up their papers immediately and cheered for Seymour, they might have been spared. Wealthy Republicans also faced danger. Dr. Thornton’s home was ransacked. In a separate incident, the father of a plantation owner, Dr. M. L. Lee, attempted to talk with the mob when they approached his son’s plantation. He and other freedmen were quickly abducted. They kept the freedmen alive to translate for them since the French, Italian, and Spanish speaking captors could not understand Dr. Lee’s English. After dark, the freedmen were murdered and Dr. Lee was released. When an armed posse, allegedly directed by Chailaire, approached Ong’s plantation, they were halted by freedmen who refused to leave and claimed in Creole French they would fight. The standoff terminated once federal troops arrived. After the dust settled and hundreds of troops stormed in, 35 freedpeople and two whites (Feliu and Curties) were dead. According to Thornton, “I do not mean to say that there were only thirty-five negroes murdered during the riots. I have no doubt there were many more, but these all that were officially reported to me.” Some put the death toll lower and some put it as high as one-hundred. There are various reports that some killings continued into early November. Judge Toca and Sheriff Chailaire arrested sixty-four freedmen in connection with the murder of Feliu. Not one white person was ever arrested or held accountable. The political ramifications were dire. Come election time, Grant received only 1 vote from St. Bernard Parish, despite the parish voting for a Republican judge, a Republican constitution, and containing a Republican majority. The Democrats’ reign of terror succeeded in sealing a Seymour victory for the parish and throughout Louisiana. However, Grant won the nation due to the black vote, becoming the first president to win with a minority of the white vote. Reconstruction lasted until 1877. 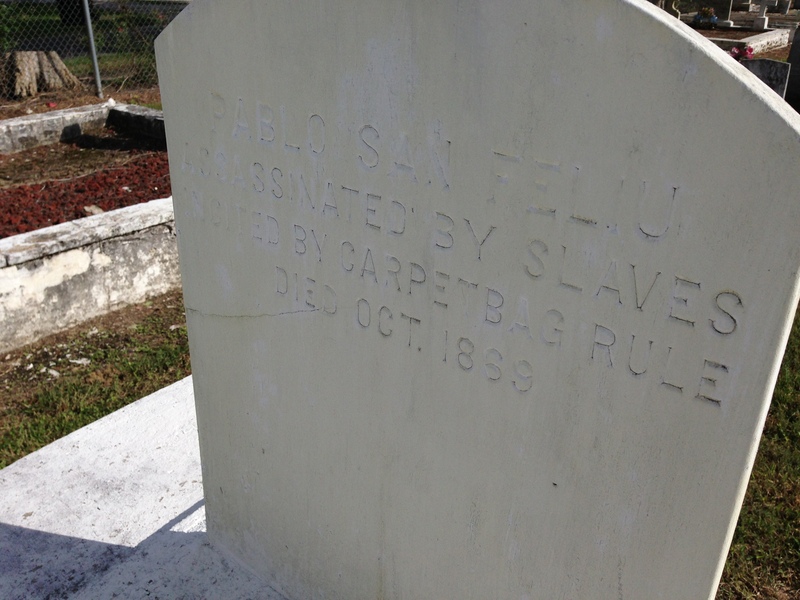 Photo of Pablo Feliu’s tombstone in St. Bernard Cemetary- September, 2013. The tombstone implies much. Dates were not kept well among the poor in St. Bernard Parish, and the “1869” date makes me believe it was probably erected decades after as the story passed through oral tradition. The usage of “assassination” implies San Feliu was of some importance to the community. Those who erected the tomb still considered freedpeople “slaves” or they could not remember if slavery was abolished yet or not. They also put all blame on carpetbaggers. Race relations in St. Bernard reached an all time high until 1881, when in a remarkable moment in history over four hundred poor Blacks and Whites (Isleños and French) united to fight against tyrannical plantation owners for better wages. This story is worthy of a blog (or a book) in and of itself. The strike ended as plantation owners realized it was more efficient to pay incoming Sicilians than deal with the already existing rowdy parishioners. The story of the St. Bernard Parish Massacre is an untold one. As far as I can tell, the oral story is forever lost and no one can recall hearing anything about it. The Southern Historical Association published a 142 page piece, Labor Militancy and Black Grassroots Political Mobilization in the Louisiana Sugar Region, 1865-1868, and gave the Massacre a mere paragraph. My good friend Samantha Perez’s book, The Islenos of Louisiana: On the Water’s Edge and historian Gilbert C. Din’s book, The Canary Islanders of Louisiana, are the only two books I know of that mention the story. I have a great deal of information on all this as I have been working on a book about it for years. The policeman Mike Curtis, and Eugene Lock were shot in front of where the West Indies style Turner House was located, I own a portion of the tract today. Victor Estopinal was one of the participants in the riot, and several years later he was assasinated when he served as a magistrate in the town of Carollton, (now Uptown New Orleans). His murder and the resulting lynchings in retribution are listed in a study by the University Of Chicago. They never provide a motive for the original murder of the Judge, but conjecture is that is was related to the 1868 riots. Wow! This is great. I’d love to read a book about this event. We should talk more about St. Bernard Parish history. Wow, what an interesting read. Please start a blog. And I did start a blog. You’re commenting on it right now :). I don’t quite understand the comment. Can you rephrase? Thank-you for the well written article. I came upon the congressional record while doing genealogical research on Philippe, my ancestor. Needless to say I was distressed at his role in the affair. It’s important to research and remember the past, regardless of what one may find. It helps us understand who we are today, warts and all. I am also a descendant of Philippe Toca. I’d have to look back at the tree to confirm the branch. I think the relation is through a Bernos? When doing unrelated research, I found an April 10, 1835, advertisement in the “New Orleans Bee” in which Philippe Toca calls for applications to a new “country academy” for both sexes that he is founding in Plaquemines Parish–“Woodville Academy at the English Turn”. $150 per year – don’t we wish tuition was still that cheap! This story was very interesting. I must admit you were very informative about STBP. Thank you, Rhonda. It’s much appreciated! Thank you. Hopefully you can find some more interesting articles on this blog. Here’s a different subject, unless the subject is hushed-up violence in St. Bernard Parish: I’ve heard that during World War II, a “posse” lynched several German spies or sympathizers who supposedly were helping supply Nazi U-boats. True or not, I have seen a photographic image of Jackson Square, taken from the periscope of a U-boat. I do know that any occurrences of sunk shipping were suppressed in the news for fear of widespread panic; it stands to reason that discovery and/or street justice of the enemy, at home, would also be told in whispers. Thank you for researching this. I grew up on Billiot Lane, next door to the Terre aux Boeufs cemetery. As a kid, I spent quite a bit of time in that cemetery and the inscription on Pablo San Feliu’s grave piqued my interest for as long as I can remember. There definitely was U-boat activity in the Mississippi River. My grandfather worked at Todd Shipyard on the West Bank- He once met some guys that were crewman on a ship they were repairing and became friendly with them. Later on, he tolf my grandmother that some of the guys on that ship were killed when a German U-boat sank the vessel in the Gulf of Mexico. There is or was a small hand typed booklet in the St. Bernard Parish librarians office on this subject before hurricane Katrina. You had to know someone or know the name of the booklet and the author to see it you could not leave with it or copy it. It contained many local names from St. Bernard, St. Bernard that was involved in the action and some families still live here. Perhaps the names contained was the reason for the secrecy. This is a report done by a Freedmen’s Bureau in 1868 shortly after the massacre. I copied this work when I finally got my hands on it to publish my book regarding the topic. It’s short but remarkable. Let me know if you’d like to borrow it!